1. To what type of collections is owned the ArrayList class? 2. What interfaces are realized in the ArrayList class? 3. How to create an empty collection of ArrayList? 4. How to create an ArrayList of the 25 items? 5. How to add a new item in the collection ArrayList? 6. How to define the number of items of the array of ArrayList type? Property Count. 7. How to convert array of ArrayList type into the integer array? Demonstration of method ToArray(). 8. Organization of work of ArrayList class with the structures of type the structure BOOK. 8.1. Organization of structures array of “BOOK” type. Method Add(). 8.2. How to convert array ArrayList to array of structures? Demonstration of method ToArray() for structure of type BOOK. 8.3. How to define the number of items of type BOOK structure into the array ArrayList? 9. How delete all items from array of type ArrayList? Property Clear(). 10. How to delete the item from array ArrayList? Method Remove(). 11. How to copy the object of type ArrayList into another memory? Method Clone(). 12. Determining whether an item in an ArrayList array. Method Contains(). 13. How select the part of array ArrayList? Method GetRange(). 14. An example of sum calculation of items of ArrayList array. 15. Search of position of first occurence of item in array ArrayList. Method IndexOf(). 16. How to insert an item in the given position of array ArrayList? Method Insert(). 17. How of a given position insert another array to array ArrayList? Method InsertRange(). 18. Determining of last occurence a given item. Method LastIndexOf(). 19. How delete the item from array ArrayList from a given position? Method RemoveAt(). 20. Deleting the range of values, given by indexes. Method RemoveRange(). 21. Reverse the array ArrayList. Method Reverse(). 22. Copying the items of array ArrayList into another array. Method SetRange(). 23. How sort the array of type ArrayList? Method Sort(). 24. How to copy from ArrayList to the ListBox control? 3. How to create an empty collection ArrayList? To add a new item in the collection ArrayList you need use method Add(). In the example below is formed a dynamic array that contains 3 items: [12, 23, 88]. Added items are the type object. For this is used property Count. 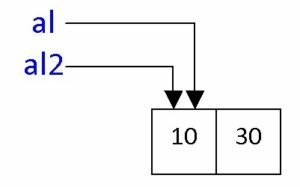 In the example below is converted the array al of type ArrayList into the array ar of integer numbers. Also, the sum of array ar items is calculated. Let’s organize a dinamic array of type “struct BOOK” using the ArrayList class. In the example below is realized the converting of dinamic array al of type ArrayList into the array of BOOK structures. The name of array is ar. Let there be given a structure of type “BOOK” with entered data about a two books (see p.8.1). To get the number of entered books, need to use the property Count. Example 1. Deleting the item 20 from ArrayList. Command Remove() removes the first occurence of item with a specified value value. That is, if in the list of several items is a value of 20 then only be removed first element. Example 2. Removing of several items 20 from array ArrayList. If is necessary to copy from a variable al with allocating additional memory then need to use method Clone(). 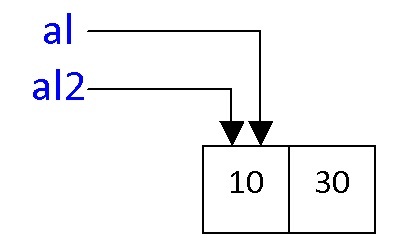 In this case variables “al” and “al2” point to different memory areas (Figure 3). Method Contains() returns true, when item is in the ArrayList. Otherwise, it returns false. Method GetRange() returns array of type ArrayList, that is a subset of current array ArrayList. In the example below is calculated the sum of items of ArrayList array. Items are converted to double type. To determine of position of first occurence the given item in array is used function IndexOf(). Function returns position of first occurence. If the item is not in array then function returns -1. Function has three overloaded realizations. Suppose that the following array is formed. Example 1. Search the position of first occurence of item. Example 2. Search the position from the specified index to the end of array. Function takes two parameters. First parameter – the item that is searched. Second parameter – position from which the search is starting. Example 3. Search of position of the given item. Function takes three parameters. First parameter – the item that is searched. The second option – a position from which the search starts. The third parameter – the number of characters that are considered during the search. Method Insert() is used to insert an item at a given position. Metod takes two parameters. First parametr – item, which is inserted. Second parameter – item position. 17. How to insert another array into array ArrayList at the given position? Method InsertRange(). Method InsertRange() allows to insert a subarray into array of type ArrayList. Method takes two parameters. First parameter – position of inserting. Second parameter – array that is inserted. Method LastIndexOf() finds the position of last occurence of item. Method searches the position from the end to the begin of array. If the item is not found, the method returns -1. The method has three overloads. // Search the value 30 from position -1 to the begin of array. To delete the item in ArrayList from a given position, you need to use method RemoveAt(). To delete several items from the array ArrayList by selected range, you need to use method RemoveRange(). Method takes two parameters. First parameter – index, from which deleting is begun. Second parameter – number of characters, that are deleted. Function Reverse() reverses the array of type ArrayList in the backward order. Function has two overloads. Example1. Using the function Reverse(). Example 2. Function Reverse() which takes two parameters. First parameter – position number, from which reverse is realised. Second parameter – number of items, that are processed. Method SetRange() copies items of array ArrayList into another array ArrayList by chanhging them. Method Sort() sorts the items of array ArrayList using a realization of interface IComparable. 24. How to copy data from ArrayList to the ListBox control? An example that copies data from ArrayList into the ListBox control for displaying it on the form. Example 2. Copying the structure BOOK (see p.8).